Note: this page is focused on the Polish service of the gun. You can read more about its development and design in Wikipedia article. Letter W indicates external links to other relevant Wikipedia articles. Polish wz.1902/26 gun captured by the Germans. Well visible is a fixed shield, with unfolded upper and lower part, and a movable shield behind. An abandoned wz.1902/26 gun, with a Russian limber for 36 rounds of infantry artillery (well visible are drawers and a crew seat). The gun has an upper shield folded, in a marching position, and a lower skirt unfolded. Two wz.1902/26 guns with 100 mm wz.14/19 howitzers, captured by the Germans. A interesting shot, on which one gun and one howitzer have folded shields, and the rest have unfolded upper shields. There is apparently a bullet mark on left gun's shield. Wz.1902/26 gun captured by the Germans. Well visible details, including a folded angled directional stick upon a tail. A full crew of the gun from infantry artillery, with an open caisson (of Russian origin). An ammunition soldier is setting a fuze in a French setter, which suggests, that this is wz.1902/26 gun, however it has an original wide spade and straight directional handle. A layer is making chalk notes on a shield. In mounted artillery there was an additional crewman, to roughly aim the gun by moving its tail, and there were different caissons. 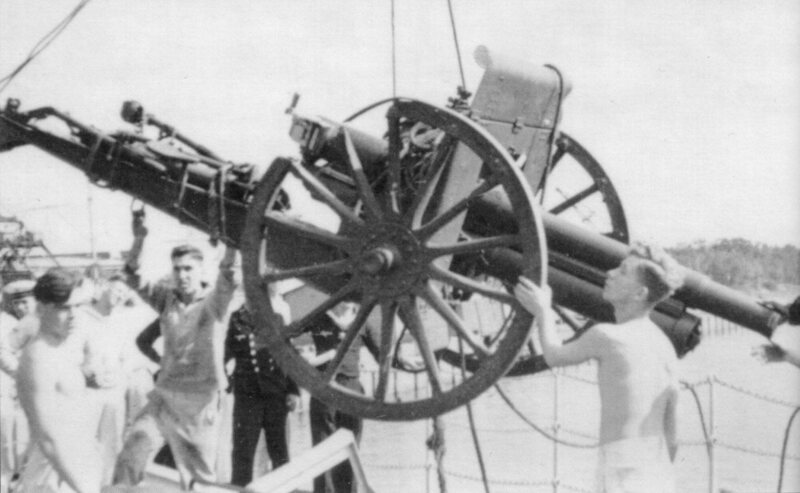 A damaged 76.2mm wz.1902 gun from Westerplatte is taken abord "Schleswig-Holstein" battleship as a trophy. 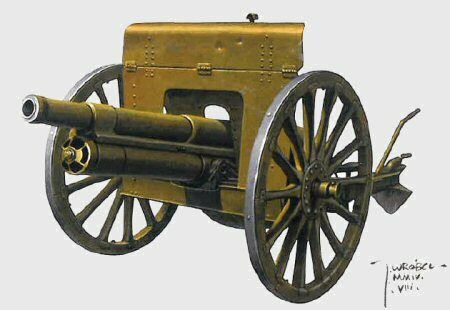 Russian 76.2 mm model 1902 field gun (obrazca 1902 goda), initially known as a 3-inch gun, was a design of Putilov Works in St. Petersburg, inspired by the French 75 mm Mle 1897. It appeared a satisfactory design, cheap and reliable, and similarly long-lived, as its French counterpart, taking active part in World War II. It remained a basic Russian and Soviet field gun until the 1930s, and was also used by several other countries, usually using captured guns. One of main foreign users was Poland, where they were designated wz. 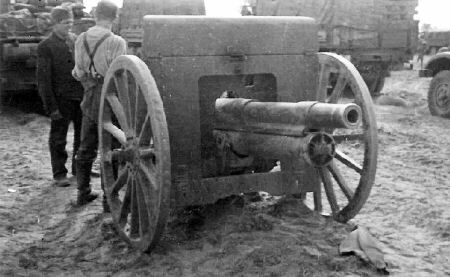 1902 (1902 Pattern) or wz.02 gun, and later converted to 75 mm wz. 1902/26 guns. First few wz.1902 guns were found on Polish territory when Poland regained its independence in November 1918, in former German or Austrian depots of war booties. In April-May 1919 there were only 20 such guns in Polish inventory, but in a course of wars with Western UkraineW and Soviet RussiaW in 1918-1920, this number grew thanks to great quantity of captured material. On 1 October 1920 Poland had 322 guns wz.1902 in service, what made it second most numerous artillery piece, after 75 mm wz.1897 guns. From 1920, these guns started to become a standard in mounted artillery of cavalry units - by the beginning of 1921 they replaced other systems there, and remained in this role until World War II. An advantage in this purpose was their rugged construction and low centre of gravity, allowing fast ride, despite they were slightly heavy. Initially they were also used in some light artillery units. These guns were also used as an armament of armoured trains, which were in a great part war booties as well. Some of them had guns simply put on flatcars, with some kind of protection. In 1923, there were 568 guns wz.1902 in inventory. Reportedly, 108 guns were exchanged with Romania for wz.1897 guns. In mid-1920s it was decided to refit Polish wz.1902 guns in order to use French 75 mm ammunition of wz.1897 gun. A reason was a limited stock of Russian ammunition and a desire of standardization, especially that 75 mm ammunition was manufactured in Poland. As a result, in 1926-1930 most of guns were converted to 75 mm caliber in StarachowiceW Works, creating wz. 1902/26 guns, either by exchanging barrel's core tube, or fitting a special "sleeve" inside the barrel. As a side effect, their maximum range grew from 8.5 to 11 km (practical was 7 km). Also sights and training mechanism were modified - scaled in standard French units (metres and mils), instead of Russian ones. A tail was modified by replacing a wide spade with a narrow one, and a straight directional handle with a bended one (not in all guns?). There were also other minor modifications, among others holders for equipement were added to carriage sides. For wz.02/26 guns there were adapted Russian and Italian limbers and caissons, modified in Poland. Apart from a mounted artillery, from 1928 wz.02/26 guns went to newly created gun platoons in infantry regiments. From a report of the Polish artillery by General Miller it is apparent, that at least 466 guns must have been converted to wz.02/26 (other sources give numbers "around 400", 429 or 461). These guns were comonly called ''prawosławna'' ('the orthodox') in Poland, due to their Russian origin. 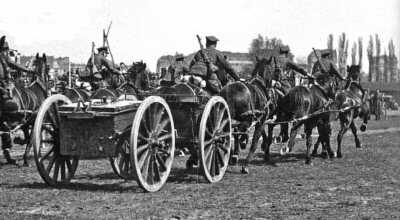 Wz.1902/26 guns were the only gun type used in eleven Mounted Artillery Detachments (Polish: Dywizjon artylerii konnej, dak), in each Cavalry Brigade. In 1938 there were 210 guns in the mounted artillery. A detachment (Polish: dywizjon, not to confuse with a division) had 12 or 16 guns, in four-gun batteries; their number depended on whether the Cavalry Brigade had three or four cavalry regiments. The battery cosisted of two platoons. In 1939 there were eight three-battery detachments (Nos. 2-7, 13, 14) and three four-battery detachments (Nos. 1, 9, 11). There were also created at least three additional batteries and one platoon of surplus guns during the mobilization. Second user of 75 mm wz.1902/26 guns were two-gun infantry artillery platoons in 90 Infantry Regiments of 30 regular Infantry Divisions. Their primary purpose was to provide the infantry with a direct support in an attack. In 1938 there were 186 guns in the infantry. Despite plans, regiments of reserve Infantry Divisions did not receive own artillery. 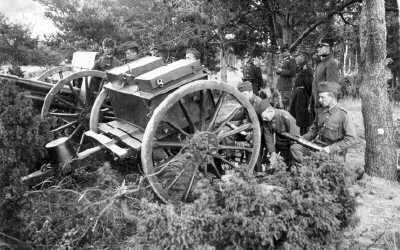 It is noteworthy, that Polish regimental artillery had longer range (and potential anti-tank capabilities), than regimental artillery of enemies, as a side effect of adopting old field guns instead of special short-barrel infantry guns. On the other hand, special infantry guns were lighter and could accompany the infantry more easily (not mentioning, that German and Soviet infantry regiments had more guns available). 75 mm guns wz.02/26 were also used in Polish armoured trains, mounted in artillery turrets of armoured wagons, on original shortened gun beds, or on anti-aircraft Lender mountings. Ten mobilized armoured trains used 25 guns 75 mm in total, four more guns were in reserve wagons. 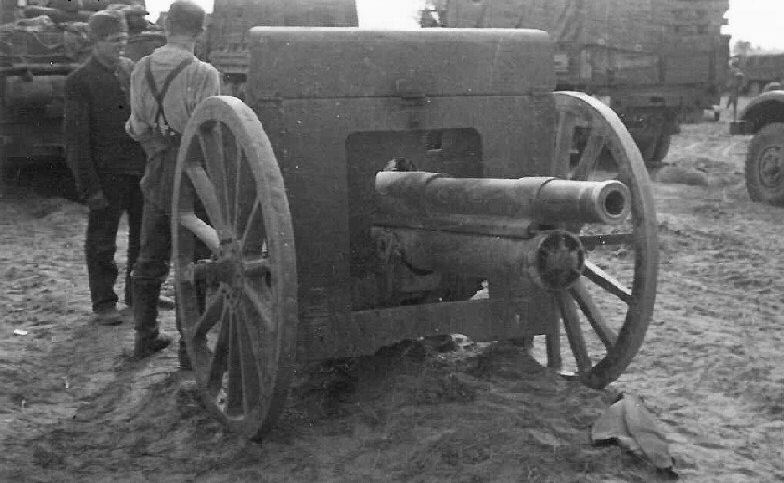 The guns captured by the Germans were assigned a designation 7,5 cm FK 02/26(p). They were still used in captured Polish armoured trains (Panzerzuge: 10, 11, 21, 22). 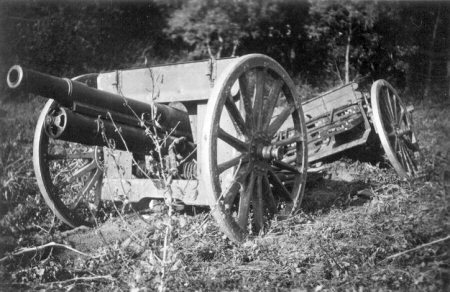 Shortages of more modern equipment in a later course of war caused, that even part of obsolete towed guns FK 02/26(p) were assigned to combat units, eg. the 299th Infantry Division of VI Army Corps, fighting and destroyed on Belarus in June 1944. Apart from 75 mm wz.1902/26 guns, a small number of original 76.2 mm wz.1902 guns remained in Polish service - there were 89 in August 1939. Half of these guns were used to create 22 two-gun positional artillery platoons, assigned to units defending fortified areas (eg. Wizna, Modlin, Węgierska Górka, Osowiec). They were meant for a stationary defence, for they had no horse teams and could be pulled for a short distance only by crews. According to some sources, part of them were to be built-in into fortifications. It should be noted, that wz.1902 guns differed from all other guns used by the Polish in 1939 by having a Russian system of scaling sights and training mechanism. There was also created one three-gun platoon No. 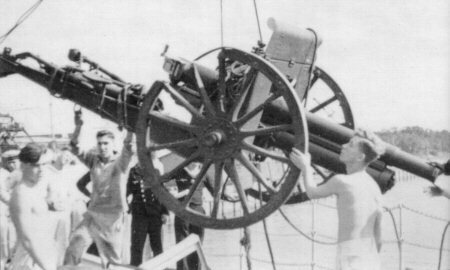 111, but in summer of 1939 one of its 76.2 mm guns was clandestinely sent to Polish transit depot at WesterplatteW in Gdańsk, defence of which became one of symbols of Polish campaign. It was the only field gun available at Westerplatte and on 1 September 1939 it fired 28 rounds across a harbour channel, destroying German MG emplacements in warehouses, before it was damaged by a battleship "Schleswig-Holstein". The platoon No.111 itself, with two guns, was assigned to the 2nd Naval Rifle Regiment of the Land Coastal DefenceW, defending an area around Gdynia until 19 September 1939 (apart from these, it had own platoon of 75 mm wz.1897 guns, and both types operated together, what caused some trouble for a commanding officer, due to different methods of aiming). Some guns were given to the KOP - Border Protection CorpsW, defending an eastern border against the Soviet invasionW after 17 September 1939. There were at least 7 guns assigned in September 1938 for Sarny fortified area (it is hovewer not clear, if they were not replaced with wz.1897 guns subsequently, according to later order). The KOP also had three of the mentioned positional artillery platoons, created in KOP NCO School in Osowiec (Nos.36-38). Most of Polish artillery pieces were captured by the Germans, the rest were captured by the Soviets. In November-December 1940 the Germans sold to Finland 54 original 76 mm guns model 1902, presumably of Polish origin. In Finland they were designated 76 K/02 and joined 195 guns of this model already in posession (most being captured from the Soviets in 1918-1940). It was most numerous Finnish field gun of World War II, and they remained for training for many years after (you can read about Finnish usage of M.1902 guns on Jaeger Platoon site). A side view of a Russian caisson modified in Poland, with added top boxes for fuzes. The wz.02/26 gun of mounted artillery, with an Italian caisson (its shaft should be normally folded). A photo was taken before shooting, because the gun is positioned 0.5m before caisson (after several shots it moved rearwards and dug firmly in a ground). Italian caisson of the mounted artillery moving at a quick pace - 1st Mouted Artillery Detachment, Warsaw, 3 May 1938. The gun was towed by six horses, using a limber. Another six horses towed a caisson with a limber. Russian-origin limbers, used in infantry artillery, carried 36 rounds, and caissons - 44 rounds, in 9 or 11 four-round drawers[note 1]. Ammunition was unitary. Fuzes were kept in two boxes added atop of the caisson. Italian limbers, used in mounted artillery, carried 32 rounds, and caissons - 64 rounds, stored vertically (originally they came from Italian 75 mm wz.1906R guns, withdrawn earlier). 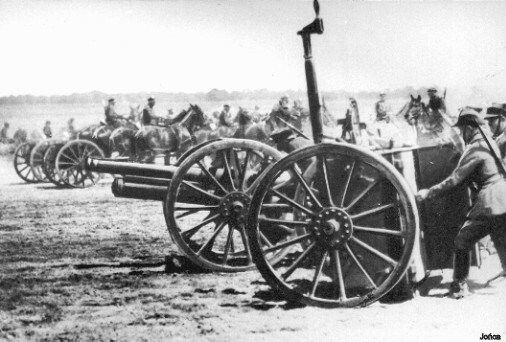 Some number of Russian limbers were used in mounted artillery as well (differing in lack of crew seats). Limber and caisson of an ammunition supply column, of Russian origin, had 48 and 36 rounds respectively (? - probable error, possibly these figures should be reversed). In infantry artillery, the gun's crew travelled on limbers (three upon each), the gun's commander and the caisson's commander had own horses, and there was a horseman on left horse in each pair. The gun's crew was 6 plus commander, and there were 14 men in total. In mounted artillery, all the crew rode horses. The gun's crew was 7 plus commander, and there were 19 men in total, including the caisson's commander, 6 horsemen and 4 horse-holders. You can see a chart of rounds from a manual at Axis History Forum. In late 1930s it was suggested to modify 75 mm guns of infantry regiments by fitting optical sights of 37 mm wz.36 AT guns, in order to improve their ability of fighting tanks, but it was not proceeded by the war. The guns could only fight tanks with less precise direct artillery fire. There were available AP and SAP grenades, but in a very limited quantity (20 rounds per a battery in June 1939). On the other hand, HE grenades were usually enough to destroy all lightly armoured tanks of 1939, or at least damage them, even in case of close bursts, not mentioning direct hits. It should be realised, that in a field artillery there were usually used time fuzes, activating in a pre-calculated place, rather, than simple impact fuzes. 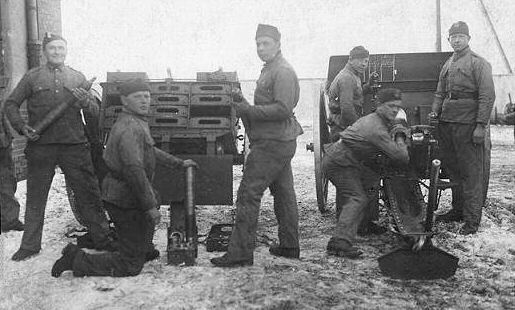 Russian-origin limber of the infantry artillery (with crew seats) - on the right, with an open case. Italian-origin caisson of the mounted artillery - on the right, in a combat position, with a fuze setter attached. 1. The issue of Russian-origin limbers and caissons, used by infantry artillery, is not entirely clear. They all used four-round drawers for ammunition. 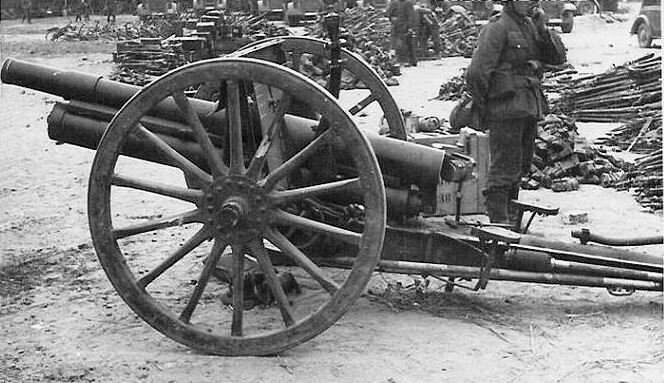 In Russian service, light artillery limbers M1900 carried 40 or 44 rounds in 10 or 11 drawers. Mounted artillery limbers were lower and carried 28 rounds in 7 drawers. In each case, there was a drawer for equipment taking place of one or two central drawers, in relation to a theoretical number of 12 or 9 slots available. A Russian caisson took 48 rounds in 12 drawers. Polish manual gives a number of 44 rounds in the caisson, but it is not clear, why it could not carry 48 rounds. Possibly one upper central slot was used in other purpose, but available photos do not show a difference. Source  states, that Polish caisson took 48 rounds as well. As for Polish-adapted limbers, they have three drawers in three rows each, for 36 rounds. Therefore, they might be in fact modified Russian mounted artillery limbers, fitted with seats for a crew, and two additional drawers for ammunition instead of an equipment drawer, rather, than light artillery limbers, which had four rows of slots.